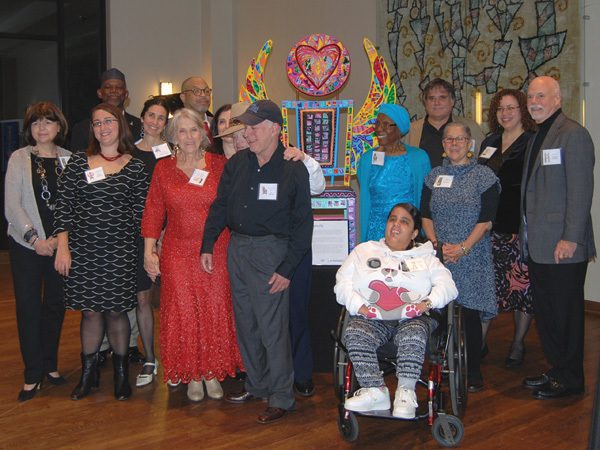 At the Wae Center's 10th anniversary dinner in November 2014, founder and director Marilynn Schneider, third from left, with the lead artists nd some of their Wae co-creators of the "Chairs of Inclusion." 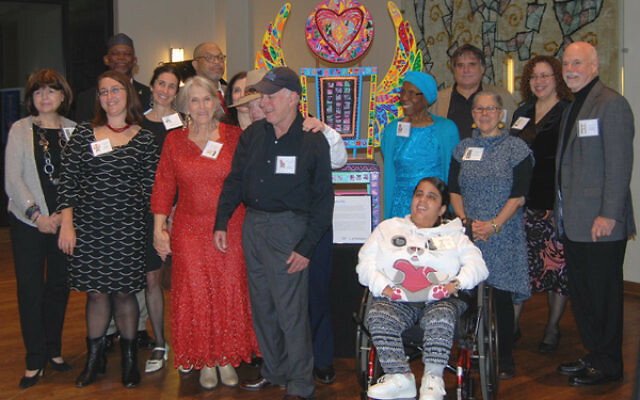 Twenty years after it became an independent agency of what was then the Jewish Federation of MetroWest NJ, the Jewish Service for the Developmentally Disabled is celebrating its success with a party and plans for expansion. On Sunday, Nov. 6, the West Orange-based facility, which has provided residences and artistic programs for hundreds of adults with special needs, will honor two of its most prominent past presidents and host a concert by folksinger Peter Yarrow, one member of the famed trio Peter, Paul, and Mary. The program, which will run from 6:30 p.m. to 9:30 p.m. at the Bickford Theatre in the Morris Museum in Morristown, will pay tribute to JSDD stalwarts Lois Rose of Livingston and Lynda Wachsteter of Short Hills. The agency grew out of the federation’s Commission on Individuals with Disabilities, which opened its first group residential home in Millburn in 1989. At first, there was only a part-time program director and six residents at the first kosher Jewish traditional residential program. Six years later the commission became the independent JSDD and opened a second group home in West Caldwell. Today the organization supports 40 people in 11 residential programs in Millburn, Maplewood, Livingston, West Orange, West Caldwell, Verona, Parsippany, Whippany, and Summit. As one of the few sets of kosher residential homes in the state for adults with special needs, the JSDD gives preference to people who are looking for kosher residential facilities. Between 70 and 75 percent of the residents are Jewish. In addition, JSDD operates the WAE Center (its initials stand for Wellness, Arts, and Enrichment) as part of its headquarters on Pleasant Valley Way. It is an alternative learning facility whose members “explore avenues for maximizing independence and achieving personal fulfillment,” said Linda Press, who has been JSDD’s executive director since 2001. Press began there after stints working with people with special needs at the ARC of Essex, the Spina Bifida Association of NJ, and the JCC West Orange. When she began at JSDD, Marilyn Schneider was the director its residential programs. “We went to the day programs the residents were attending and many of them did not seem happy with those programs,” Press told NJ Jewish News as she sat behind her desk in a brightly colored office decorated with arts and crafts made by Wae Center members. “We found the programs to be just day care. Maybe they had a TV or went to the mall or to the park with staff supervision. They sat around coloring in coloring books. When we asked what they would prefer to be doing they couldn’t answer that question. They didn’t know what their choices were. So Marilyn and I developed a continuing education program to expose them to a variety of things and from there they could choose something else,” she said. Over the years the Wae Center has offered its members such activities as writing, painting, film, music, and yoga. “They go to the theater, they go to community-based festivals, and we are always encouraging them to express themselves and encouraging family members to get involved and engaged, too. We encourage employment if that is an option. It gives them self-esteem,” said Press. Because she herself has a sister with special needs, Wachsteter became involved with the federation’s Commission on Individuals with Disabilities after moving to Short Hills from North Carolina in 1976. Rose’s involvement began as an associate director of budget and planning at the MetroWest federation in the mid-1980s. It was a time when it offered few services for people with special needs.